The NTSB's full report is available at http://www.ntsb.gov/investigations/AccidentReports/Pages/AccidentReports.aspx. The Aircraft Accident Report number is NTSB/AAR-16/01. On December 8, 2014, about 1041 eastern standard time, an Embraer EMB-500 airplane (marketed as the Phenom 100), N100EQ, registered to and operated by Sage Aviation LLC, crashed while on approach to runway 14 at Montgomery County Airpark (GAI), Gaithersburg, Maryland. The airplane impacted three houses and the ground about 3/4 mile from the approach end of the runway. 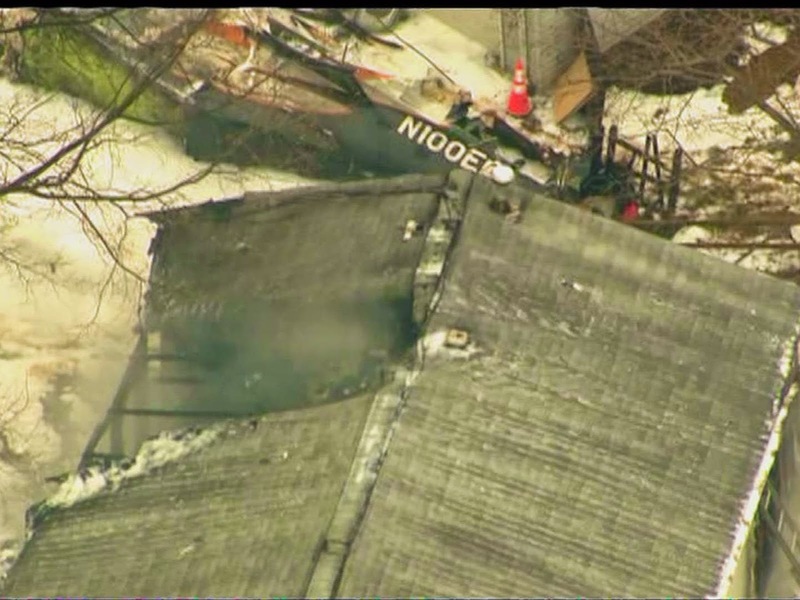 A postcrash fire involving the airplane and one of the three houses, which contained three occupants, ensued. 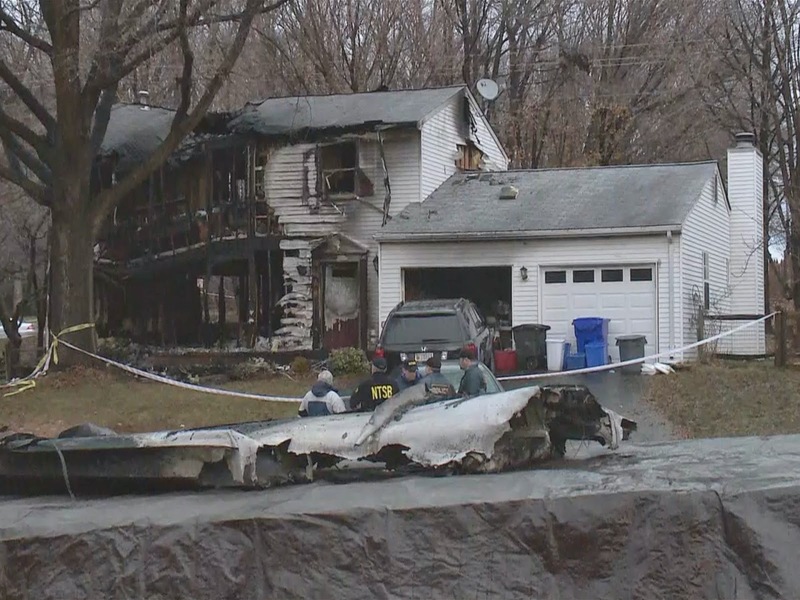 The pilot, the two passengers, and the three people in the house died as a result of the accident. The airplane was destroyed by impact forces and postcrash fire. The flight was operating on an instrument flight rules (IFR) flight plan under the provisions of 14 Code of Federal Regulations (CFR) Part 91. Visual meteorological conditions prevailed at the time of the accident. the pilot's conduct of an approach in structural icing conditions without turning on the airplane's wing and horizontal stabilizer deice system, leading to ice accumulation on those surfaces, and without using the appropriate landing performance speeds for the weather conditions and airplane weight, as indicated in the airplane's standard operating procedures, which together resulted in an aerodynamic stall at an altitude at which a recovery was not possible. 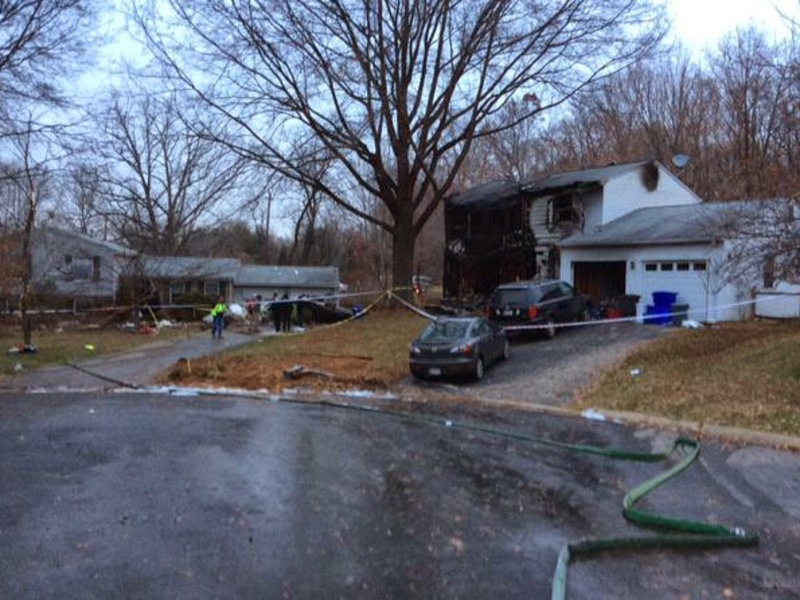 WASHINGTON – Pilot errors caused a Embraer EMB-500 Phenom 100t to crash into a Gaithersburg home more than a year ago, killing the mother and her two young children inside, a report from the National Transportation Safety Board found Tuesday. In December 2014, a plane stalled during an approach to Montgomery County Airpark and crashed into the home of the Gemmell family. Marie Gemmell, 36, died as she tried to protect her children Cole, 3, and 1-month-old Devin from the smoke and fire when the plane struck their home. The two children also died. The family’s father Ken Gemmell and an older daughter, Arabelle, were not home during the crash. The pilot, Dr. Michael Rosenberg, 66, and two others on the plane, David Hartman, 52, and Chijioke Ogbuka, 31, also were killed in the crash. 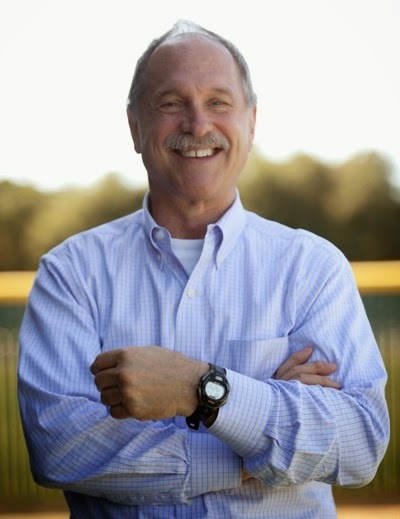 Rosenberg was founder and CEO of Health Decisions, a clinical research organization in Durham, North Carolina. The plane had flown from Horace Williams Airport in Chapel Hill, North Carolina and was supposed to land at Montgomery County Airpark. According to the NTSB report, Rosenberg failed to turn on crucial deicing equipment and skipped pre-flight checks, which led to the deadly jet crash. The NTSB issued three recommendations Tuesday: Two focused on developing automated alerts for pilots of small jets to remind them that deicing equipment should be activated, and a third focused on training. There were signs the Rosenberg was rushing before takeoff and that he did not take enough time to do full pre-flight checks. According to NTSB investigators, pilot miscalculations, the wrong flap settings, and the failure to activate deicing systems caused the plane travel more than 30 knots slower than it should have been. By the time automated stall warnings sounded, it was too late. Robert Sumwalt, a member of the NTSB, said that Rosenberg had been involved in a prior incident in March 2010 and said that in 2011 the pilot had violated temporary flight restrictions in restricted airspace. Sumwalt did not provide further details about the incidents during a hearing Tuesday. 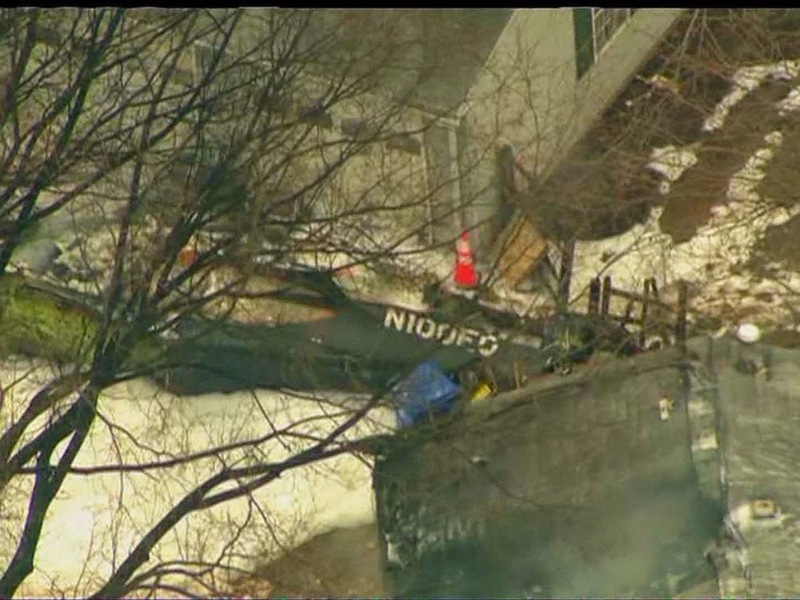 Rosenberg had piloted a plane that crashed in Gaithersburg on March 1, 2010, WTOP has reported. Investigators said the airpark was not to blame for the crash but said air traffic controllers should have communicated two reports of icing in the area to pilots prior to the crash. 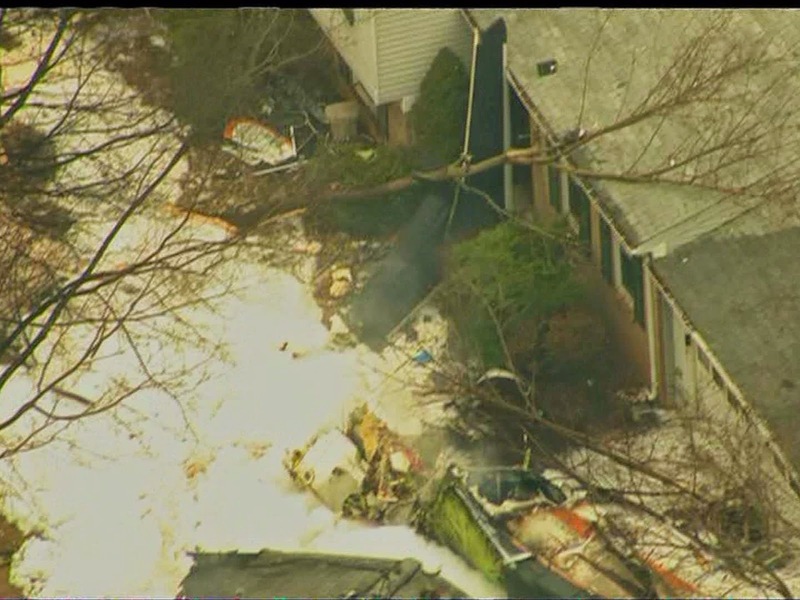 Ice on the wings brought down a twin-engine private jet that crashed into a Montgomery County house in 2014, killing three people onboard and a mother and two children who lived in the house, according to the findings in a detailed report released by the National Transportation Safety Board on Wednesday. 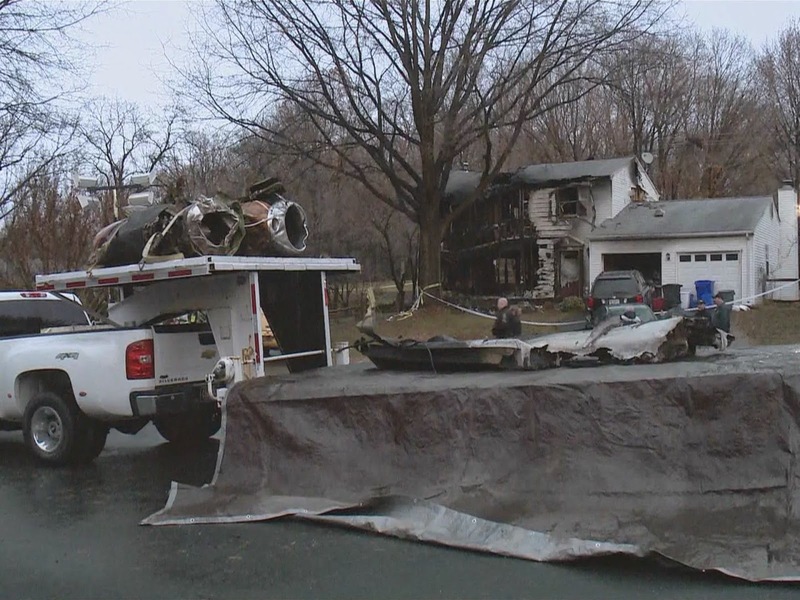 If the pilot, Michael Rosenberg, had turned on the plane’s de-icing system before he approached Montgomery County Airpark in Gaithersburg, he probably would have received a stall warning in time to avoid crashing into a development a half-mile from the runway, the agency said. Rosenberg, 66, two of his passengers and the mother, Marie Gemmell, 36, and her children died when the plane crashed into the house and exploded in flames Dec. 8, 2014. The Embraer EMB-500/Phenom 100’s twin jet engines continued to function normally, but the plane slowed too dramatically to reach the runway. With its flaps extended and landing gear down on final approach, the plane should have been flying at 120 mph. The cockpit data recorder showed it was going 101 mph in the final seconds of flight. As it approached the Gemmell home, the plane went into an aerodynamic stall, with its tail sharply down and nose elevated. At that angle, normal air flow to keep it aloft ceased, and the plane lost its ability to fly. In the final 20 seconds before the crash, according to the cockpit voice and data recorder, an automated warning in the cockpit chanted “stall-stall, stall-stall” 13 times in staccato rhythm. The plane was completing a bumpy 57-minute flight from Chapel Hill, N.C., near the Durham headquarters for Rosenberg’s medical research firm. As it flew through Northern Virginia and into Maryland, other pilots were reporting ice attempting to form on their wings as they flew through clouds between 4,000 feet and 5,500 feet altitude. Rosenberg turned on the plane’s de-icing system for more than two minutes as it reached its 23,000-foot cruising altitude, but then he flicked if off again for the remainder of the flight. It remained off as he began to descend toward Gaithersburg, despite flying through clouds again. Rosenberg was a highly qualified pilot, with 4,500 hours logged in control of an aircraft. He was certified as a commercial pilot and as a flight instructor. He also was rated to fly the Phenom, a sophisticated six-passenger jet that costs more than $4 million and can fly in excess of 400 mph. But the 2014 incident was the second time that Rosenberg crashed while attempting to land at the Gaithersburg airport. Four years earlier, stall warnings sounded as he touched a single-engine turboprop plane down on the runway. When the plane drifted to the left side of the 75-foot-wide runway, Rosenberg attempted to lift off again to circle the airport for a second landing attempt. Instead, the plane went about 100 feet to the left and crashed into trees. He escaped with a minor injury. 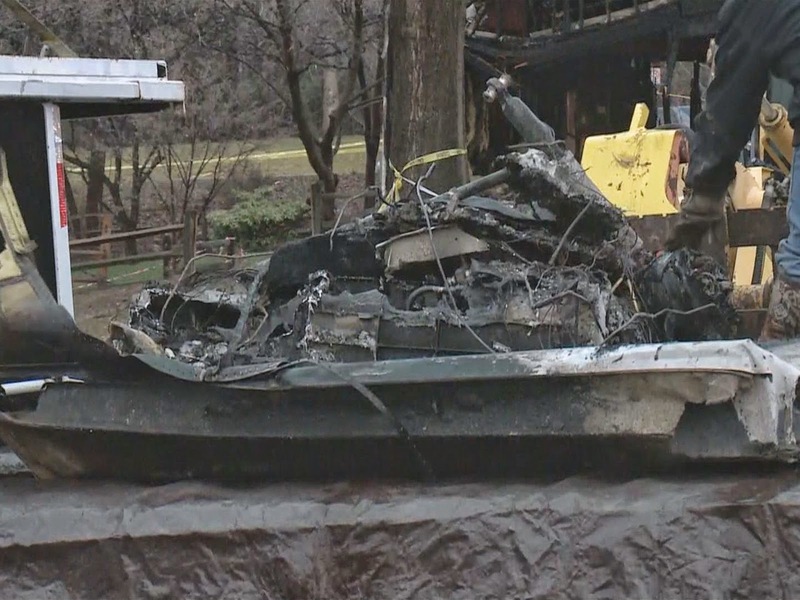 The NTSB concluded that the cause was pilot error. 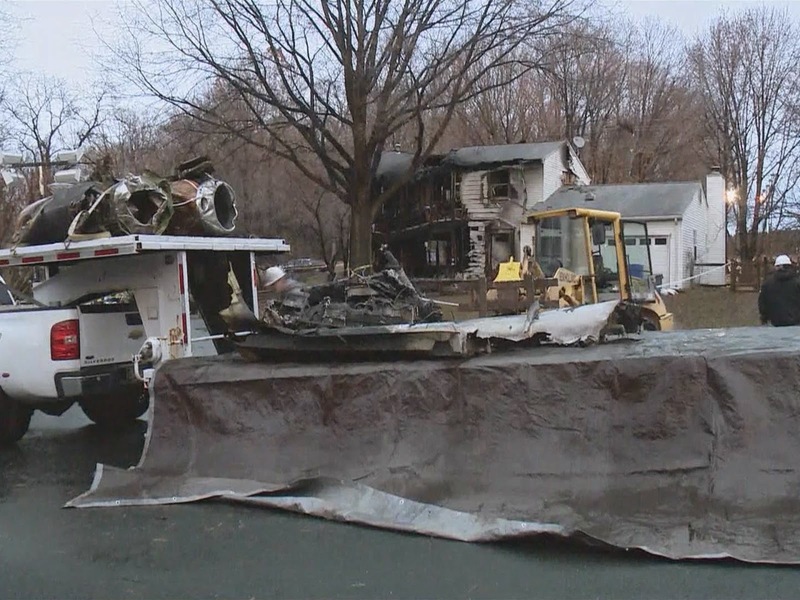 More than 1,000 small planes crash in the United States every year, and hundreds of those crashes result in fatalities, but few achieve the horrible distinction of what happened in Gaithersburg on the Monday morning of Dec. 8, 2014. The calls began flooding into the 911 dispatcher at 10:42 a.m.
Rosenberg and his passengers — David Hartman, 52, and Chijioke Ogbuka, 31 — were dead. And a fire, helped along by an explosion of jet-fuel, was closing in on Marie Gemmell, 36, her son, Cole, 3, and infant, Devin. They were huddled in a second-floor bathroom — one child in Gemmell’s arms, the other tucked between her legs. Small planes have crashed into houses or buildings in the United States over 110 times since 2000, but most of the more than 120 deaths have been pilots or passengers, not people in the sanctuary of their home. The four-bedroom house at 19733 Drop Forge Lane sits on a cul-de-sac a bit more than a half-mile from the end of the airport runway. It is in Hunters Woods, one of many neighborhoods that developed over the years around an airport that was surrounded by farmland when it opened in 1959. The frame house with white siding, a two-car garage, a deck in the back and a tree planted in the front, was built in 1982. That did not happen with the tragic consequences that the man envisioned until 30 years later. People who live in Hunters Woods have developed a certain expertise about small planes after years of watching them take off and land. 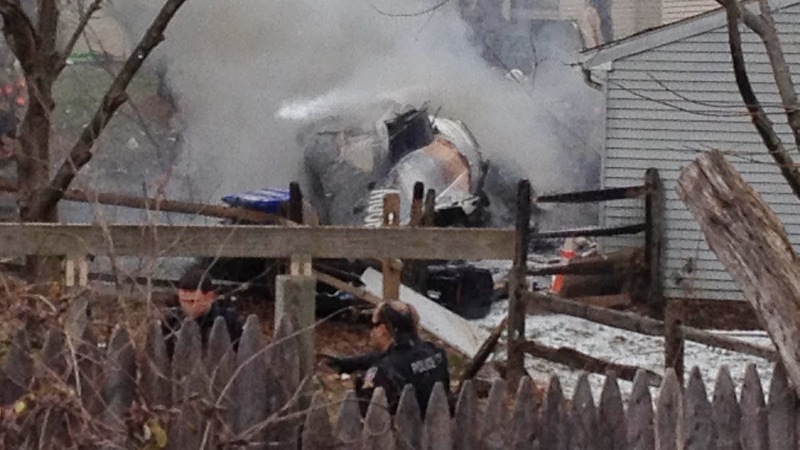 The blue-and-white wreckage of the airplane tumbled into the front yard. 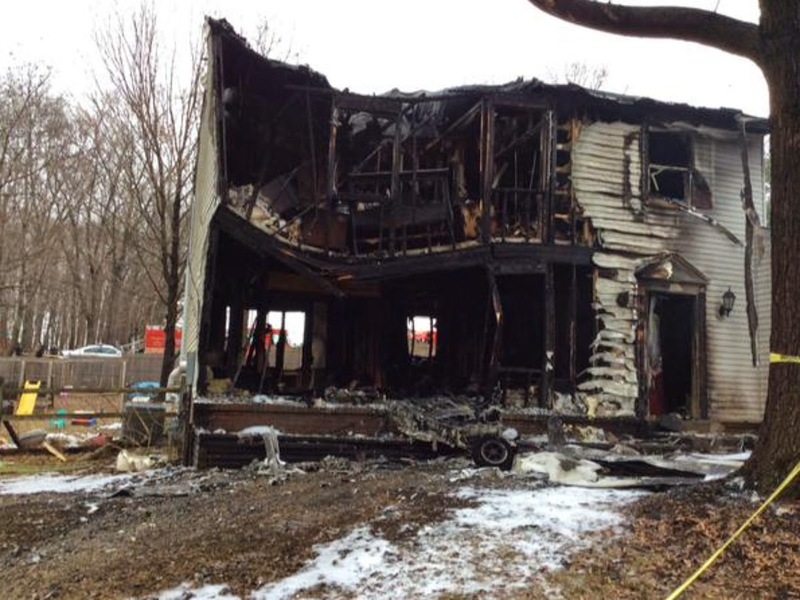 The house, as firefighters are prone to say, was “fully engaged” by flames. Gemmell and her children were overcome by smoke and died. On December 8, 2014, about 1041 Eastern Standard Time (EST), an Embraer EMB-500 Phenom 100, N100EQ, impacted terrain and houses about 0.75 miles short of runway 14 while on approach to Montgomery County Airpark (GAI), Gaithersburg, Maryland. The airline transport rated pilot and two passengers were fatally injured as well as three persons on the ground. 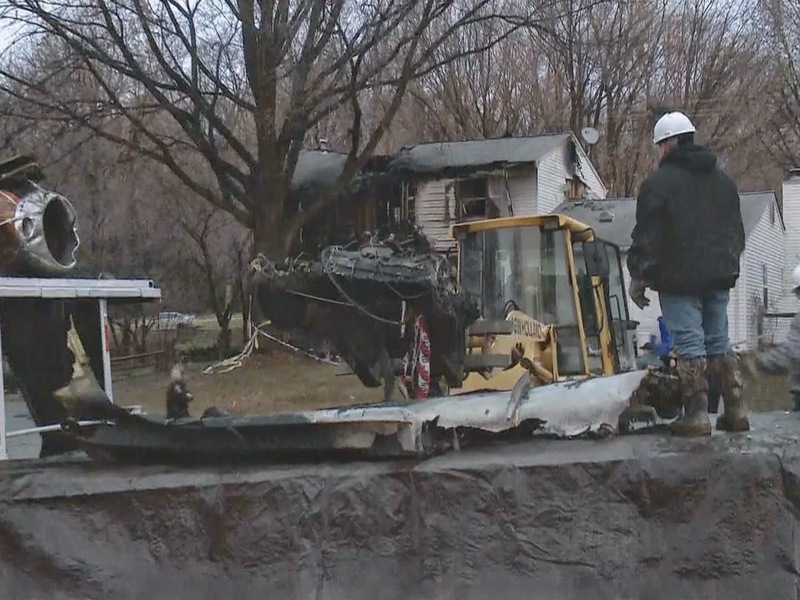 The airplane was destroyed during the impact and ensuing fire. Marginal visual meteorological conditions prevailed at the time and the flight was operating on an instrument flight rules (IFR) flight plan. The airplane was registered to and operated by Sage Aviation LLC., of Chapel Hill, North Carolina, under the provisions of 14 Code of Federal Regulations Part 91 as a personal flight. The flight originated from Horace Williams Airport (IGX), Chapel Hill, North Carolina, with GAI as its intended destination. On December 8, 2014, a tragic event took the lives of Marie Gemmell, Cole Gemmell and Devin Gemmell. Marie was born on October 24, 1978 in Point Pleasant, New Jersey. She died while trying to protect her two young sons both born in Gaithersburg, Maryland on October 22, 2011 and October 23, 2014. Marie was raised in Brick, New Jersey and attended Brick Memorial, where she graduated in 1997. She then went on to attend Rowan University where she graduated with a B.A. in Communications – Radio/TV/Film during 2001. Marie was very involved with campus activities including Phi Sigma Sigma sorority, Student Government Association, and conducting campus tours for potential incoming students. While at Rowan University, Marie met the love of her life and college sweetheart, Ken Gemmell. Within a year of her college graduation, Marie and Ken were engaged and living in Montgomery County, Maryland. During a beautiful fall wedding ceremony held in 2004, Marie and Ken married and shortly thereafter moved into their dream home in Gaithersburg. In 2007, Marie gave birth to Arabelle, who was joined by siblings Cole in 2011 and Devin in 2014. She was a loving, devoted and patient mother who always put her children and family first; Marie’s last act on Earth is a testament to the depth of her love and sacrifice for her children. Professionally, Marie recognized that the Washington area isn’t the ideal area to begin a television career and worked as a Project Administrator at Davis Construction for over a decade. In March 2013, she joined First Potomac Realty Trust as an Administrative Assistant. Marie was always the life of the party, and she was very active in the community and non-profits including Connor Cures, an organization that raises funds for pediatric brain and spinal cancer research. Just weeks before her passing, she was instrumental in organizing the 2nd Annual Connor Cures Gala and Silent Auction, held November 15 in Washington, DC. Marie, Cole and Devin are survived by Ken Gemmell, a loving husband and father, their daughter Arabelle Gemmell, mother Kathleen Wagner, and brothers Thomas Mahan and Edd Mahan. In the aftermath of the plane crash in Gaithersburg Monday, that claimed 6 lives, I noticed most news accounts dismissed weather as a possible cause. “The weather — scattered clouds at 2,100 feet and a 7-mph northeast wind — [did not] appear to play a factor,” wrote the Post’s Ashley Halsey, for example. More than likely, they’re right – the weather wasn’t a factor. But is there some remote chance that weather played a role? Two aviation experts I spoke to said yes, while stressing they believe investigators will ultimately determine the cause was something unrelated to weather. So what exactly is the unlikely scenario that weather may have contributed to the accident? Icing – or the build-up of ice on the aircraft – which adds weight to the aircraft and disrupts the flow of air over the wings. Although weather observations from Gaithersburg Airport indicated just scattered cloud cover in the vicinity around the time of the accident, there were light snow showers in the region before and after it, along with subfreezing temperatures, which could have, hypothetically, caused icing. 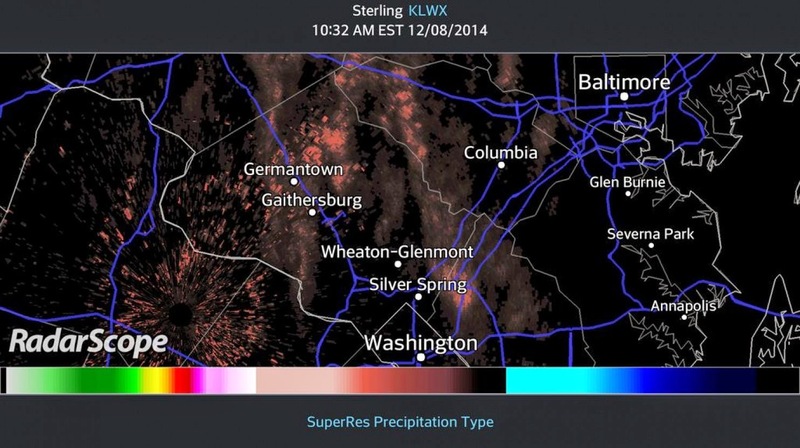 At 10:32 a.m., just 15 minutes prior to the crash, radar indeed showed light snow showers in the region. Capital Weather Gang readers reported flurries in Gaithersburg shortly after 11 a.m., not long after the crash. My first thought when I heard about it was that it could have been icing since my supervisor was teleworking in Frederick that day and [messaged] me about the flurries earlier … indeed there was a report of moderate icing at 5,000 ft just southwest of Frederick at 10:45 a.m., the exact time of the crash. Finally, the reports of the plane gaining then losing altitude before barrel rolling, as well as sputtering engines (ice in the engines?) could point towards icing since it would cause loss of lift. On the other hand, there were no other significant reports of icing, and even moderate icing shouldn’t be a problem as long as you don’t continually fly in it. Also, the pilot didn’t appear to report it or indicate any problems like that. Plus, lots of other things could cause the plane to act erratically, including bird strikes or being out of gas. As you probably heard there were reports of large flocks of birds in the area. Personally, I’m inclined to think it wasn’t weather related, but it certainly can’t be ruled out. One other thing to consider that bolsters the icing theory. I just read an article that said the plane almost stalled before crashing. There have been cases before where some of the instruments on the plane collect water and freeze up, including the speed indicator. In fact, I believe that’s what happened in the Air France [June 1, 2009] case. If that happened, the pilot would believe he was going faster than he actually was, and by the time the stall warning started it could have been too late to recover. [G]enerally [flurries or light snow] alone should not pose a significant hazard to an aircraft that is certificated to fly in icing conditions. I will add that flurries or snow become a bigger issue when they build up on the aircraft surfaces of non-icing certificated aircraft or while on the ground, thus the need to be deiced and anti-iced. But according to reports, there were other smaller aircraft flying around that did not have an issue with the light flurries. I’m not saying it should be ruled out, because I don’t like to speculate ahead of what the National Transportation Safety Board releases, but just based on the information released so far, I don’t really see anything glaringly obvious about the weather that could be considered a primary factor to this accident. That said, if an aircraft gets slow, ice can exacerbate the problem and cause an aerodynamic stall at a higher than normal airspeed. Still, it’s hard to say if that’s what happened here. For all we know the airplane was completely clean of ice, which is likely based on the conditions. The National Transportation Safety Board will review the possible causes of the crash and release a report some time next year. GAITHERSBURG, Md. 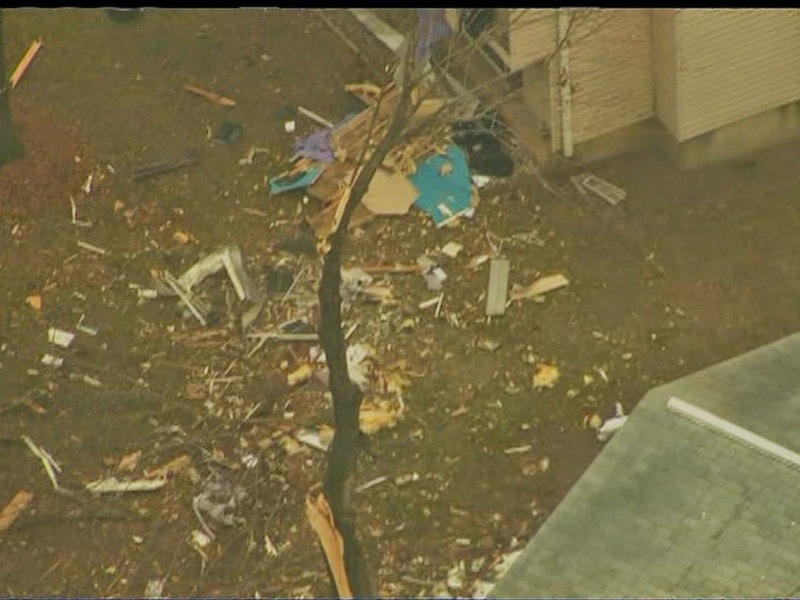 (WJZ) –Searching for clues, investigators remain at the scene where a jet crashed into a Montgomery County home. The crash left six people dead, including a mother and her two young children. 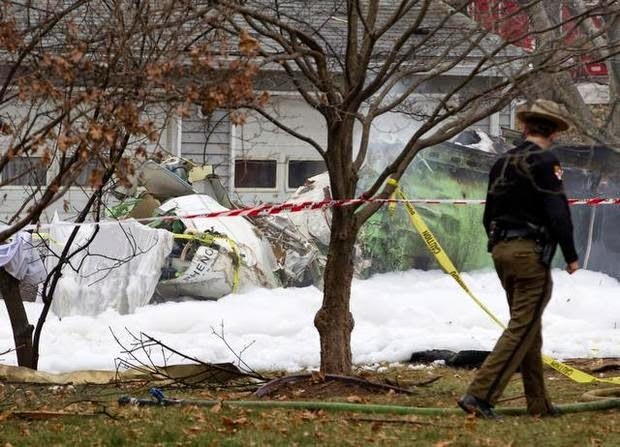 Rick Ritter reports on how investigators are digging deeper into the pilot’s past. The story rocked this community and the entire state. Crews remain on scene, but tonight WJZ is learning more about the pilot’s history and his first crash four years ago. Video shows the aftermath of Michael Rosenberg’s first plane crash in 2010. Damage and injuries were minimal compared to Monday’s tragedy. 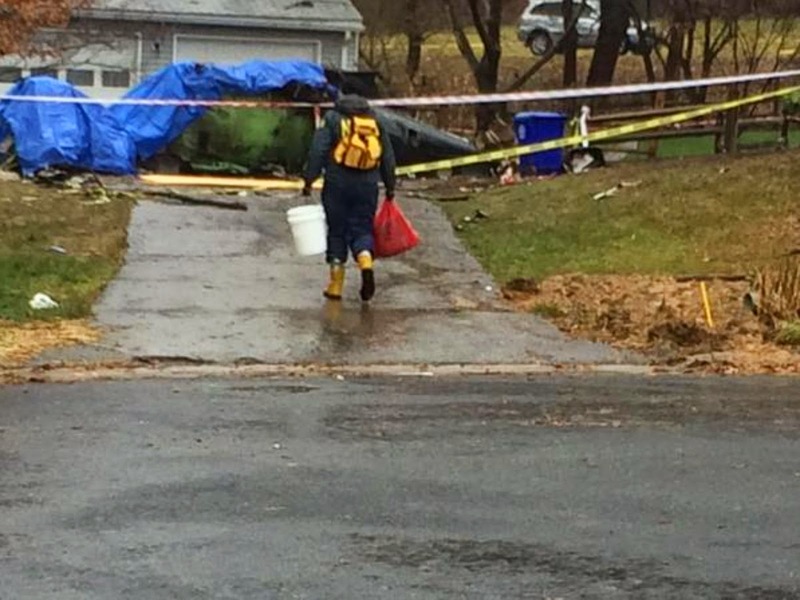 Rosenberg, a health care CEO, was behind the jet that crashed into a neighborhood near the Montgomery County airport on Monday. Killing all three people on board and Marie Gemmell, who huddled in a room with her sons, 7-week-old Devin and his brother, Cole. All three died of smoke inhalation. 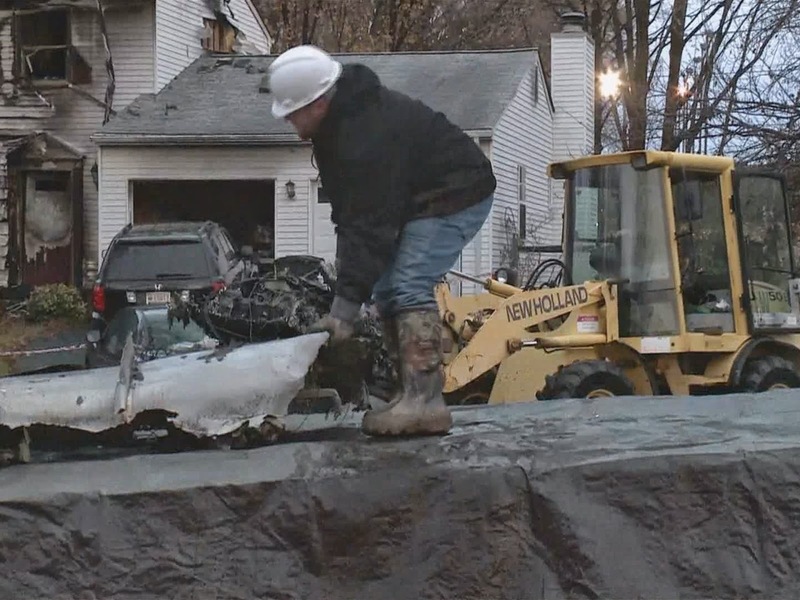 “It’s almost like you’re looking at a movie set or something… how can that be happenin,” neighbor, Jim Siron said. 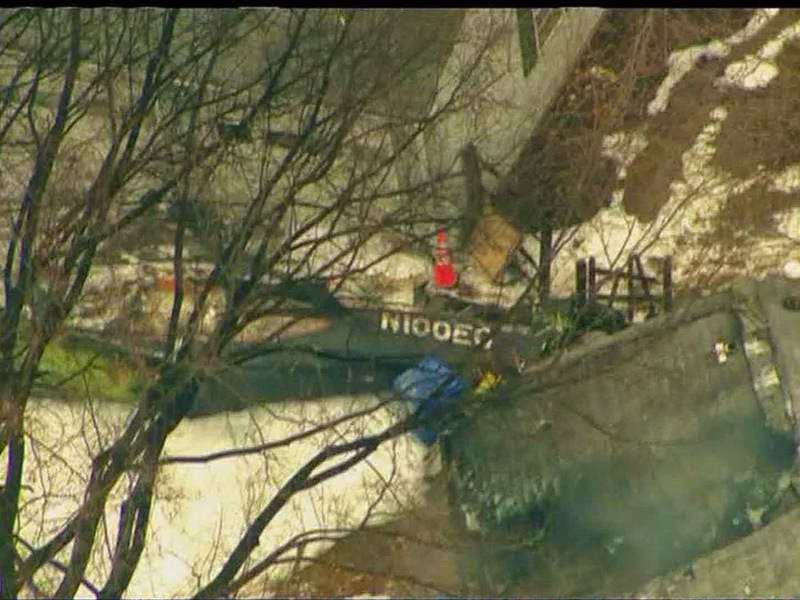 WJZ obtained photos and documents from the National Transportation Safety Board of Rosenberg’s crash four years ago, stating his plane began to drift after it landed, before ending up in trees. 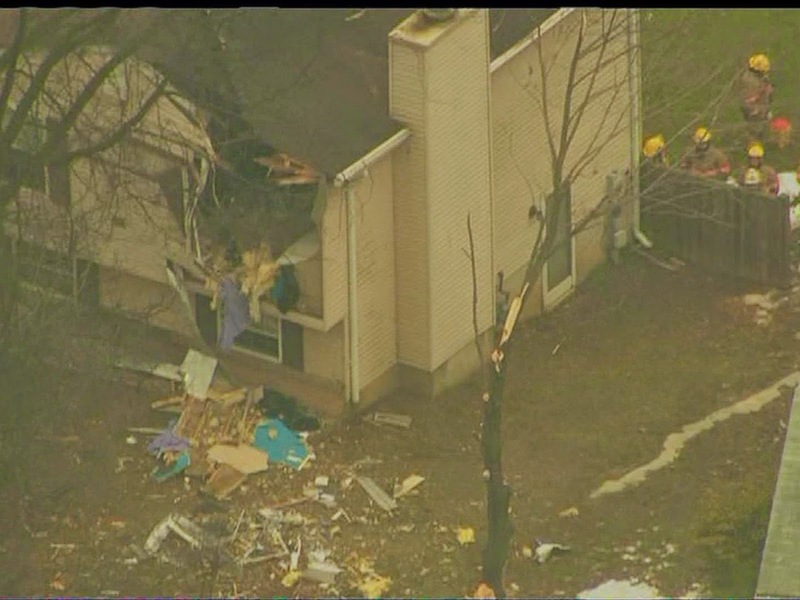 Crews continue to clean up debris and try and secure what’s left of the damaged homes. “It’s really one of the most unfortunate things that’s come along in our neighborhood in a long, long time,” Airport Advisory committee, Devin Battley said. Family and friends of the victims continue to piece together the traumatic ordeal. Since the crash, family and friends have started a fund for the Gemmell family. They’ve raised more than $400-thousand in just three days. Investigators said the plane in Monday’s crash, slowed down too fast, but there was no evidence of engine failure. GAITHERSBURG, Md. 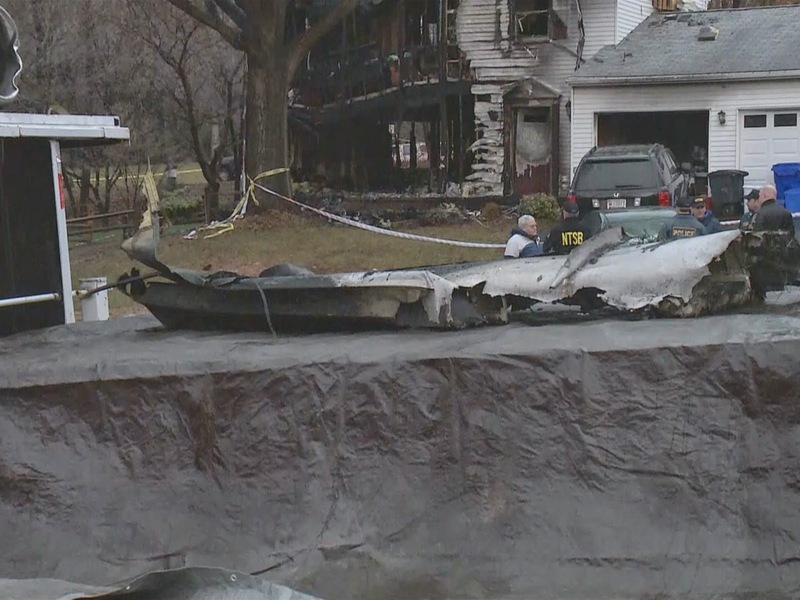 (WUSA9) -- Engine failure and birds do not appear to be the cause of a deadly plane crash in Gaithersburg on Monday, according to preliminary findings by the NTSB. 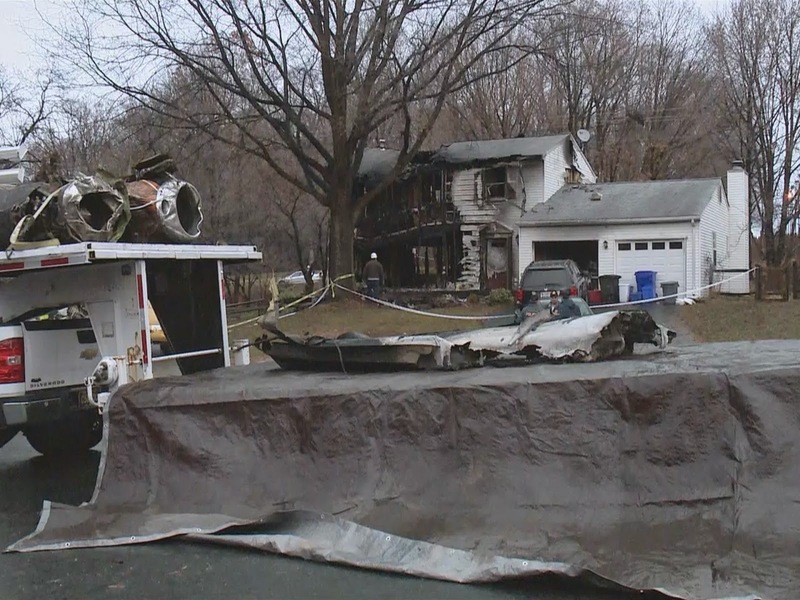 Six people died in the crash, three people on the small plane and three people in a house that caught fire after the crash. 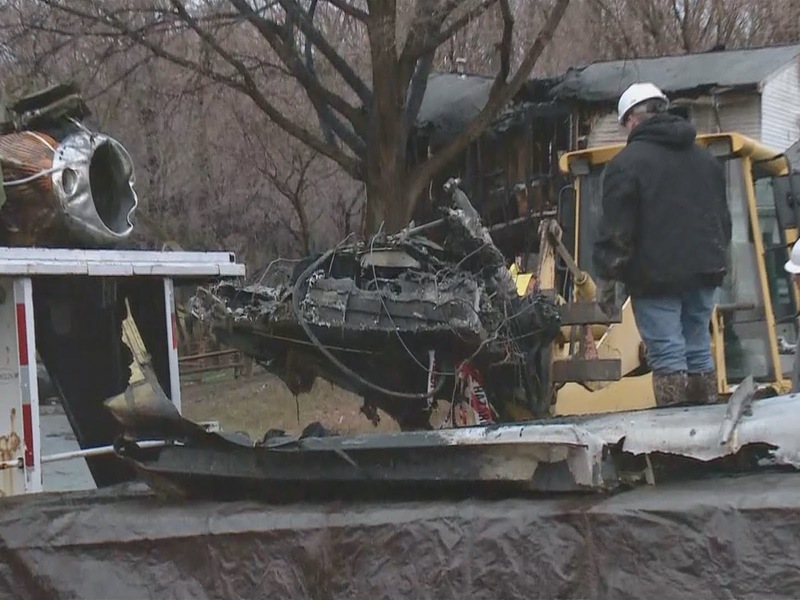 NTSB spokesperson Robert Sumwalt said there is no evidence of in-flight fire, catastrophic engine failure or bird ingestion. Although a pilot of another aircraft had reported seeing birds, those birds were located about 1,000 feet down the runway, not in the air, Sumwalt said. 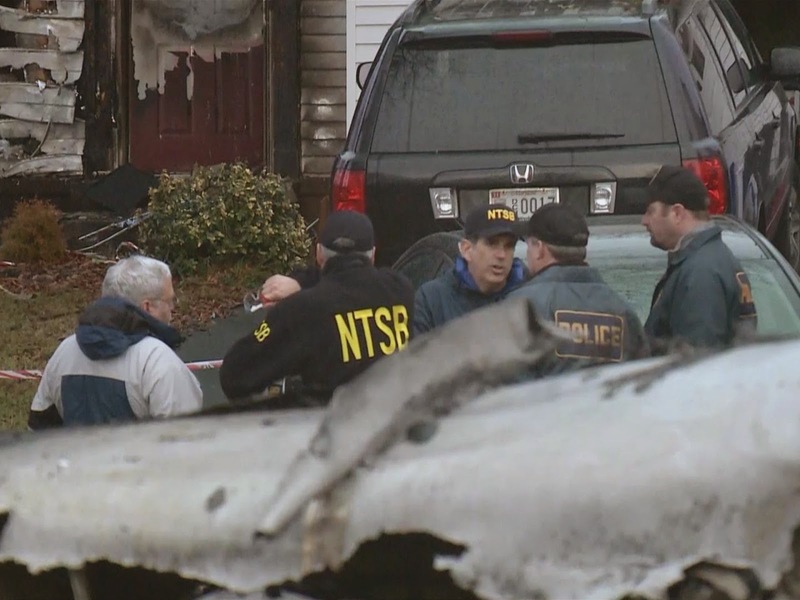 The NTSB is currently working to gather evidence, not determine the cause of the crash. All information is preliminary. Sumwalt discussed the NTSB's finding from the plane's cockpit voice recorder and flight data recorder. 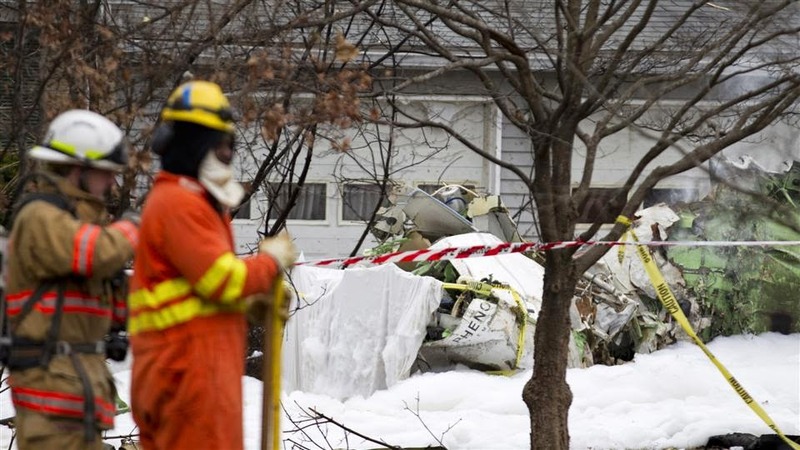 The cockpit voice recorder contained 57 minutes of good quality audio, according to the NTSB. About 20 seconds before the end of the recording, there was an automated stall-warning call out which continued until the end. A stall warning announces an impeding aerodynamic stall which happens when airflow over top of the wings gets disrupted, Sumwalt said. The lowest recorded airspeed was approximately 88 knots (101 mph), as determined using the flight data recorder. At that point there were "large excursions in pitch and in roll," according to preliminary findings by the NTSB. A structure group spent Tuesday morning diagramming the wreckage and located all four corners of the plane. That includes the nose, tail and both wing tips, and verifies that the plane was intact prior to impact. An operations group is gathering information about the pilot, identified as Michael Rosenberg. He had 4500 flying hours and had been involved in a prior accident in March 2010, according to the Sumwalt. There were three instructor pilots in area at the time of the crash, one in the traffic pattern of the plane and two on the ground. Two pilots reported seeing the plane, and both reported seeing pitch and roll, according to the NTSB's findings. A weather report taken 10 minutes before the crash reported winds out of the northeast at six knots, ten-mile visibility, a few clouds and overcast. The investigation into the cause of the plane crash is just beginning. Snouffer School Road between Goshen Road and Centerway Road remains closed Tuesday for the investigation. Investigators could spend up to seven days collecting evidence at the scene. 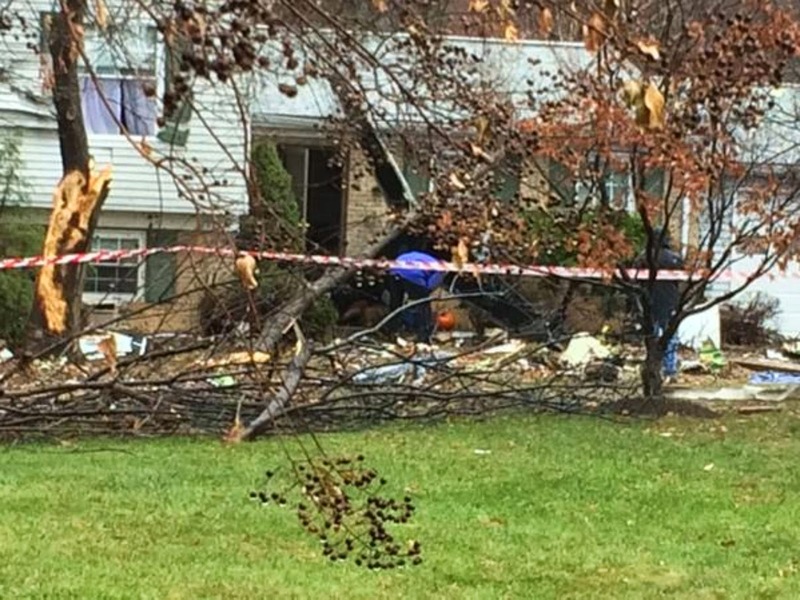 A mother and her two young sons died after a plane crashed into their house. The house was engulfed in flames. Emergency responders found Marie Gemmell and her sons, 3-year-old Cole and 6-week-old Devin, huddled together in a second floor bathroom. DURHAM, N.C. — Seconds before a jet piloted by a Durham pharmaceutical executive crashed in a suburban Washington, D.C., neighborhood Monday morning, a stall warning sounded in the plane's cockpit, the National Transportation Safety Board said Tuesday. The crash in Gaithersburg, Md., killed all three people on the plane, as well as a mother and her two young sons on the ground, authorities said. Dr. Michael Rosenberg, 66, president and chief executive of Durham-based Health Decisions, a global clinical research firm, was piloting the Embraer EMB-500/Phenom 100 twin-engine jet, according to the NTSB. 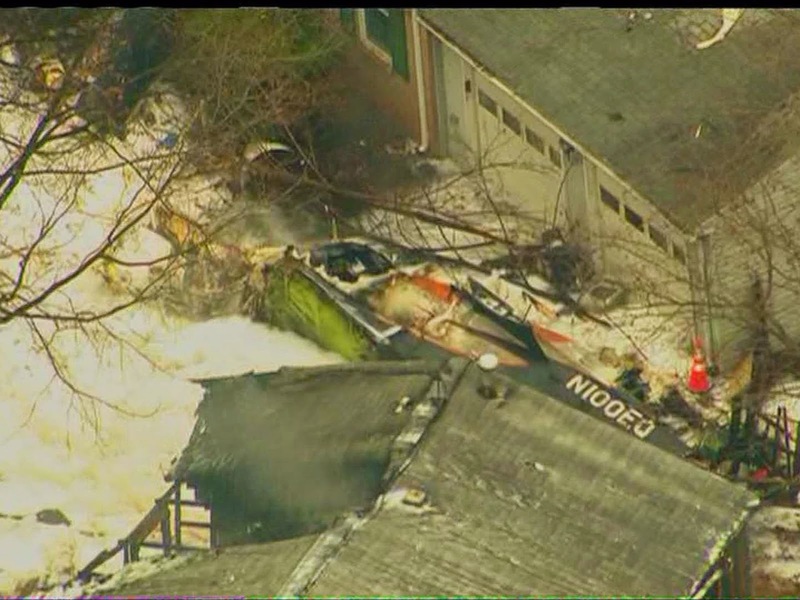 The plane was registered to Sage Aviation LLC of Chapel Hill, which is owned by Rosenberg. Rosenberg's two passengers were identified Tuesday as David Hartman, 52, vice president of clinical pharmacology, pharmacokinetics and nonclinical development at Nuventra Inc., a Durham-based clinical pharmacology consulting firm, and Chiji Ogbuka, 31, of Raleigh, a regulatory affairs manager with Health Decisions. Authorities identified the three people on the ground who were killed as 36-year-old Marie Gemmell and sons Cole, 3, and Devon, 1 month. 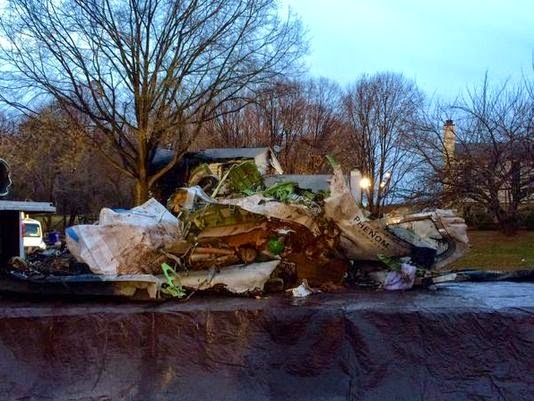 The jet took off Monday morning from Chapel Hill on its way to Montgomery County Airpark in Maryland, about a mile from the crash site. Hartman's pastor said he believes the men were on their way to Washington to meet with U.S. Food and Drug Administration officials. During a Tuesday afternoon news conference, Robert Sumwalt, an NTSB member, said the jet's flight data recorder showed that the automated "stall call-out" began sounding 20 seconds before the data recorder stopped working and continued sounding until the end. The alert indicates an impending aerodynamic stall, he said. An aerodynamic stall is unrelated to engine activity, Sumwalt said. It would occur if the angle of the plane disrupted the airflow over the wings and limited the lift needed to keep the plane aloft. The flight data recorder also noted "large excursions" in the jet's pitch – the up and down angle of its nose – and roll – the angle of its wings, Sumwalt said. A pilot in a nearby plane and two pilots on the ground also told NTSB investigators that the jet was pitching, he said. NTSB investigators have found no evidence of any engine failure or of a bird strike, Sumwalt said. They and teams from the Federal Aviation Administration, Embraer, engine maker Pratt & Whitney and airline safety officials in Canada and Brazil are still trying to determine if the engines and plane operated properly, he said. Sumwalt said he hadn't listened to the cockpit voice recorder and couldn't comment on what Rosenberg told air traffic controllers before the crash. 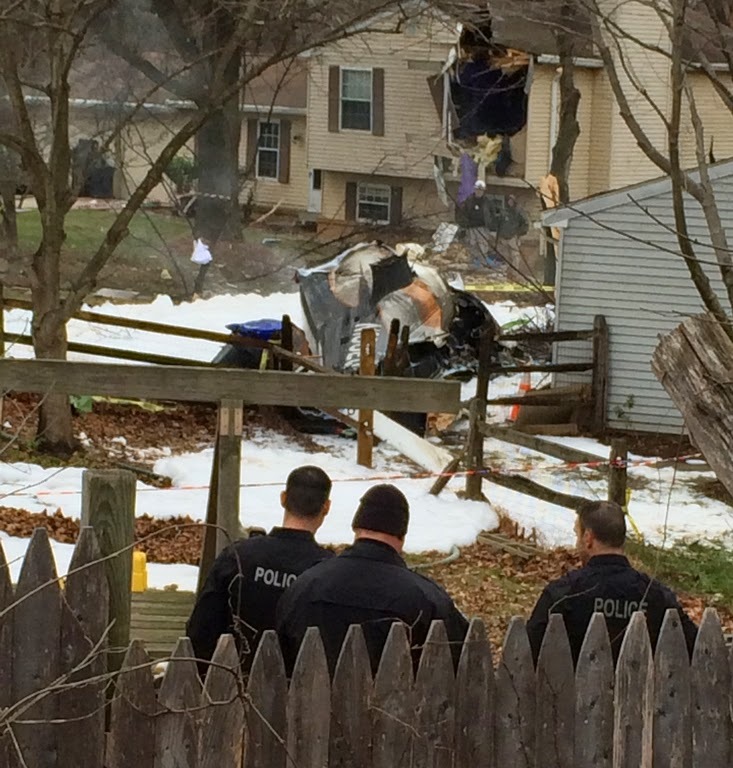 Rosenberg crashed a different plane in Gaithersburg on March 1, 2010, according to the NTSB. In that incident, a propeller-driven plane slid off the runway into a snow-covered tree line. Don Holzworth, an executive-in-residence at the Gillings School of Global Public Health at the University of North Carolina at Chapel Hill, where Rosenberg was an adjunct faculty member, said he spoke with Rosenberg after the 2010 crash. "He spoke about not flying again, but I knew him well enough to know that he would be in the air again soon," Holzworth said. Michael Jacobs, a longtime friend and a member of Health Decisions' board of directors, said piloting was part of Rosenberg's nature. "The fact that he was a pilot, that is the way he was in life," Jacobs said. "He always wanted to be the pilot and not the passenger. He’s thoroughly enjoyed flying all these years." 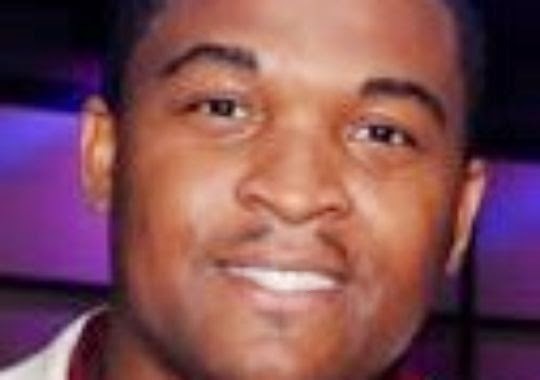 Jacobs described his friend as a forward-thinking and driven entrepreneur. Rosenberg, a physician, former manager at the Centers for Disease Control and Prevention, founded Health Decisions in 1989. "He was a very passionate person. He believed in doing things to the fullest," Jacobs said. "He loved his business. He worked on it as hard as any entrepreneur I’ve ever seen." Rosenberg was "a visionary" who cared about improving drug development, his friend said. "He pushed the envelope to try and create efficiencies in the drug discovery business that other people hadn’t," he said. He is survived by his wife, Alicia Paladin, an executive at Health Decisions, and two adult children, Zachary and Caroline. Meanwhile, Hartman's neighbors and his pastor described him as brilliant, caring and mild-mannered. "He preferred to be in the background a lot, but when you got him one- on-one, he really stepped up," said Rev. Duane Beck, pastor of Raleigh Mennonite Church. "His top values and priorities were his work and his family." "He was just an all-around great guy," neighbor Rose Allen said. "If he wasn’t out talking to my husband, he’d be shooting ball with the boys." Hartman had worked at Nuventra since January 2013. 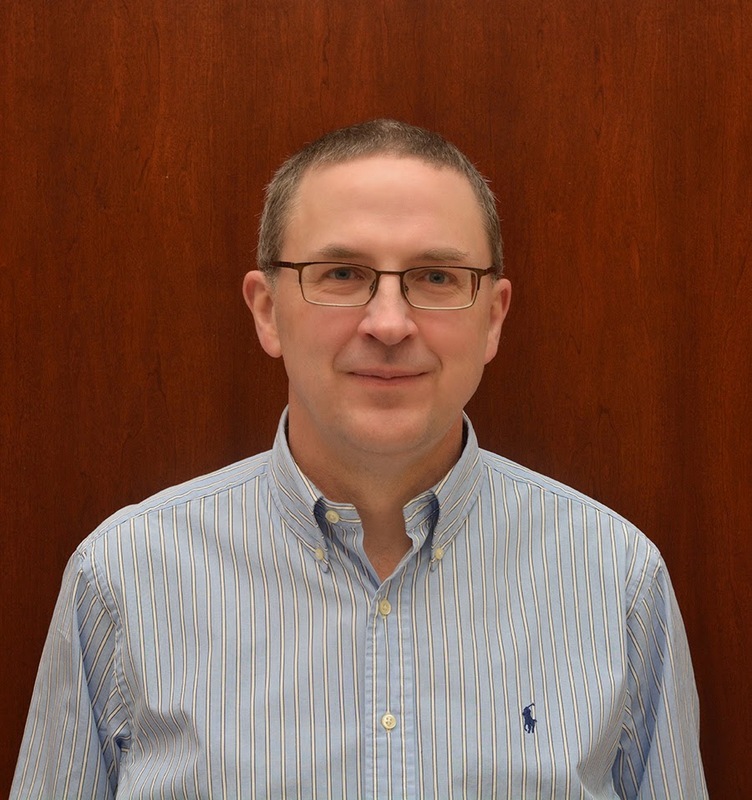 Before that, he was senior director of preclinical development at Aptiv Solutions, a pharmaceutical clinical trials company in Durham. He is survived by his wife, Janet, and two adult children, Elaine and Andrew. Allen and Chet Mebane said their north Raleigh neighborhood is in shock over Hartman's death. "It’s very, very sad," Allen said. "You can tell something’s happened here. Everyone’s just gotten real quiet." "We’re just trying to take everything in right now," Mebane said. Ogbuka's LinkedIn profile states that he also is an adjunct professor at the University of Maryland's University College and a bioethics lecturer at the University of Saint Mary. “Our deepest condolences, thoughts and prayers go out to the Ogbuka family on the tragic loss of our valued colleague Chijioke ‘Chiji’ Ogbuka in yesterday’s accident," Patrick Phillips, vice president for clinical affairs at Health Decisions, said in a statement. The jet struck three houses during the fiery, mid-morning crash. 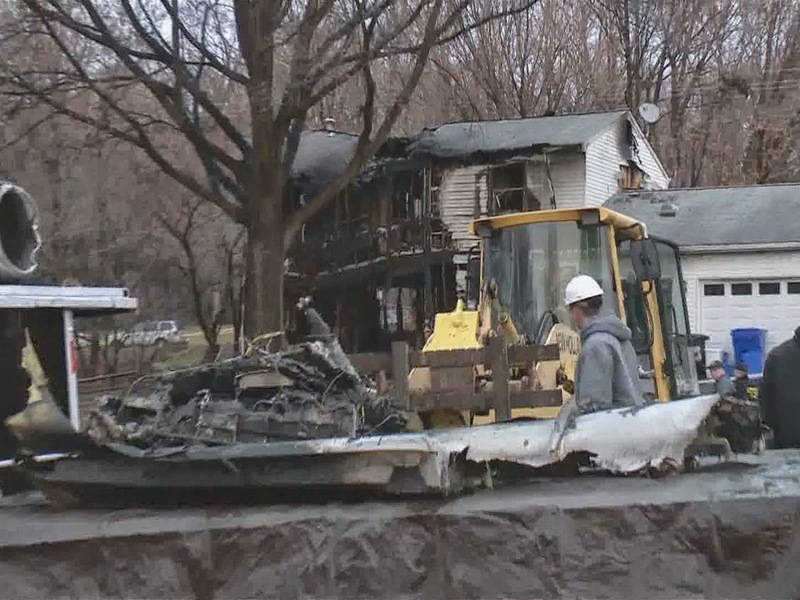 After the first home was hit, the fuselage landed in the front lawn of an adjacent home, which was heavily damaged by fire. 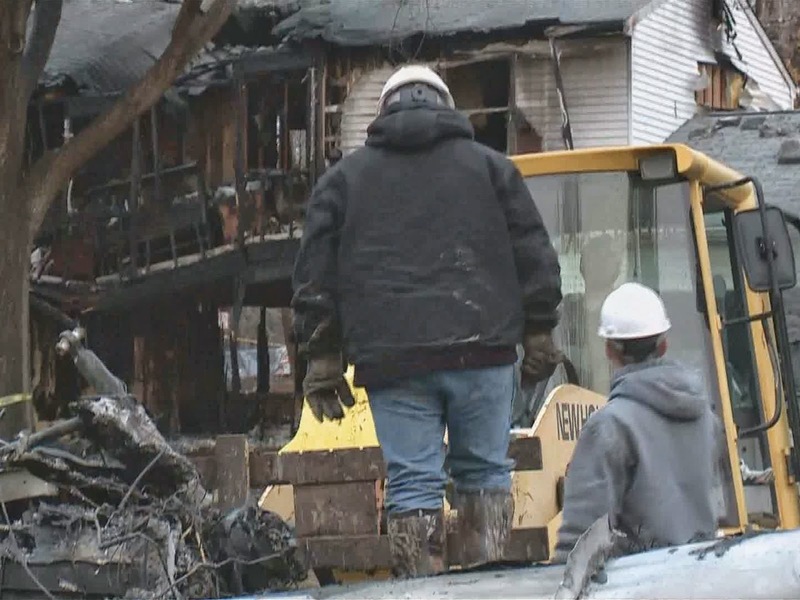 Investigators said they believe one of the wings, which had fuel inside, was sheared off and tore through the front of the Gemmell home, Sumwalt said. Witnesses reported seeing and hearing a secondary explosion after the plane hit the ground. Gammell and her two sons were found in a second-floor bathroom. She was lying on top of the boys in an apparent effort to shield them from the smoke and fire, police said. Her husband and a school-age daughter were not home at the time. No one was injured in the adjacent homes that also had major damage. A homemade light plane that slammed into a suburban street had crashed twice before and caught fire on the runway at Moorabbin Airport a month prior to the fatal accident. 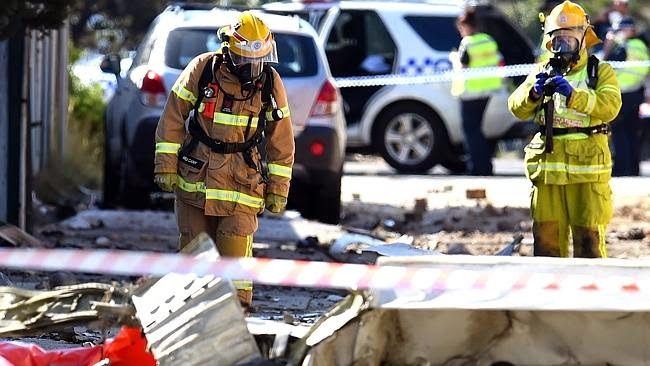 Pilot John Stephenson, 77, died when his amateur-built plane crashed into a Chelsea laneway in October, clipping homes and cars before bursting into flames. It can also be revealed he led a colorful life that included time as a police officer, one game for Carlton and a stint in jail for stealing more than $3 million from clients of his Frankston law practice. An Australian Transport Safety Bureau investigation into the Chelsea crash found Mr Stephenson’s plane, built in 1999 and registered in 2003, also crashed in 2007 and 2010. A month before the fatal accident, the plane caught fire while taxiing at Moorabbin Airport. Witnesses helped extinguish the blaze but after inspecting aircraft, the pilot “reported to friends that there appeared to be no damage”, the ATSB found. The Van’s RV-6A’s engine was replaced in 2007 after midair engine failure caused a “forced landing”, and again in 2010 when the nose collapsed and the propeller hit the ground. ATSB records show the RV-6A was the amateur model most commonly involved in accidents, with 20 between 1988 and 2010. But investigators are still trying to determine what caused the fatal crash, with flight data suggesting the engine was working normally during most of the three-­minute flight. “Work is ongoing to explain a decrease in engine oil pressure about seven seconds before the end of the recorded data,” the report said. The plane was traveling at 370km/h before a “steep nose-down” impact with the lane. Mr Stephenson was hailed as a hero for avoiding hurting anyone else. When Mr Stephenson was jailed and struck off as a lawyer in 1996, Supreme Court judge George Hampel said he was “a very good family man” who made full admissions about misappropriating more than $3 million. The money was taken from trust accounts between 1988 and 1994 when property deals soured and he was threatened by business partners. He also played one senior game for Carlton in 1958. The amateur pilot had nearly 1700 hours of flying experience, with 17 hours in the air in his last six months. The ATSB’s investigation is due to be completed in March. On 14 October 2014, at 1321 Eastern Daylight-saving time, the pilot of an amateur‑built Van’s RV-6A aircraft, registered VH-JON and being operated in the ‘Experimental Category’, reported taxiing for a local flight at Moorabbin Airport, Victoria. The aircraft was subsequently cleared by air traffic control for take-off from runway 17 Right at 1323 and to maintain runway heading to depart the control zone to the south. The aircraft was then observed on Airservices Australia surveillance radar climbing to 2,900 ft above mean sea level (AMSL) and tracking southbound via the coast, in accordance with the published departure procedures for Moorabbin Airport. After 1326:07 no further radar returns were received from the aircraft. The aircraft was observed by witnesses descending rapidly before impacting the ground next to a house in the suburb of Chelsea, 8 km to the south of Moorabbin. The aircraft was destroyed by the impact and the pilot was fatally injured. There were a number of small post-impact fires started by the accident that were subsequently extinguished by members of the public and the fire brigade. A number of houses and several cars also sustained significant damage as a result of the accident. Yesterday, I followed a vehicle down Paris’s main street and noticed the license plate on the rear of the vehicle. What caught my attention was the absence of the colorful sticker issued by the Secretary of State. If you are not familiar with the vehicle licensing requirements here in Illinois: a current sticker must be attached to the rear license plate in order for the license plates on that vehicle to be considered legal. That’s a no brainer, but if you were to ask if this car has license plates or that it’s plated, the return would undoubtedly be, yes. The clear inference is, if the car has plates it’s legal to drive the streets of Illinois when in fact, it is not legal to do so without the appropriate sticker. The same sort of thing occurs when discussing a pilot’s license. Most assume if an individual has a pilot’s license then it would be legal for him or her to fly themselves and/or friends around at their convenience. Nothing could be further from the truth. Just as in the example above, wherein, only having license plates on your car (without a current sticker) does not necessarily make it legal to drive that car on Illinois highways: having a pilot’s license without a current Medical Certificate or without having passed the required bi-annual examination does not make it legal for you to fly anything. The fact is, having a pilot’s license without the endorsements mentioned above should not and does not certify anyone to fly anything: including a broom. This brings us to a current situation at the Edgar County Airport and our new airport manager, Jerry Griffin. Given the FAA documents revealing that Jerry has not had a medical since the 90’s is it a fair statement to then call him a pilot? Probably not! It should also be pretty clear at this point, without a Medical Certificate Jerry would not be able to fly an airplane with an FAA examiner (or otherwise certified professional) in which to participate in his required biannual re-certification. In part, because these bi-annual examiners (Jerry just happens to be one of those); are not required to be pilots therefore, the person taking the bi-annual re-certification would need to have a “current” pilot’s license in the true sense of the word, to be pilot in command, and to pilot the aircraft. To put this quite simply, Jerry does not meet the FAA requirements to be a pilot and hasn’t for quite some time. Information discovered with regards to both aspects, one of not having a medical certificate, and two, of not having a biannual re-certification surfaced after his appointment. While it is very clear, documents he submitted to the county in his employment application (here) show him to be a commercial pilot with multi-engine and instrument rating, and, those documents clearly imply, suggest and in a large way state that he is a pilot and that he can legally fly airplanes: the truth is, he cannot legally do so. Now you ask; how can he have these licenses? Well, it’s really pretty simple, pilot licenses don’t have expiration dates on them. The FAA issues licenses for life…but remember, that doesn’t make them valid…it just means if you’re 120 years old, blind, can’t walk, and in a nursing home with Alzheimer’s, and strapped to a wheel chair, you’ll still have a pilot’s license to brag about. Jerry also includes his license as a certified flight instructor. Here again, we are looking at the license plates on the back side of a clunker vehicle with no sticker. Yes, he may have had or once been a flight instructor…but without a current medical, at the very best he is limited to providing ground school to new students on the ground. No, he cannot teach you to fly from start to finish. No, he cannot get into a plane with a student pilot to provide instruction and no, he cannot take control of the plane. His options are the same as anyone else. He can only ride in an airplane as a passenger… and student pilots are prohibited from hauling passengers. Only pilots can do that. Do you now think the ability to provide only a fraction of the required training for new pilots entitles you to honestly claim yourself as a certified flight instructor? No, clearly that’s misleading. Then there are the hand written notes by Jerry, claiming 1700 flight time hours over the 41 years between 1973 and 2014? That would equal about “41” hours a year if it were true. But is it? If Jerry hasn’t had a medical since the 90’s and if he’s operating legally…these hours could have only have occurred before he failed to gain a medical or in some rare cases; can be accrued as a “passenger” when riding along in a plane…but not as a pilot in command. Here again, a misleading statement. The conventional understanding regarding the hours a pilot has accrued equals the hours they were pilot in command, not passenger in observation. What else is known about Jerry? In his application Jerry claims to having repaired and rebuilt antique airplanes; and to have performed hundreds of 100 hour inspections on flight school aircraft. Oops, we’re back to the license plate thing again. Only Aircraft and Power Plant Certified mechanics are qualified to perform this work. They’re referred to as A and P’s in the aviation industry. Was Jerry claiming to be and A and P in his resume? Probably…that is, if you use the FAA definition of an A and P. The facts are; Jerry does not have an A and P certificate: therefore he cannot legally claim to do this work. Perhaps Jerry should have and could have been more truthful in his application, by stating he assisted in the same and that all of his work was completed under the supervision of a certified A and P mechanic. He chose not to. What’s left? Well, there are sources stating that Jerry was in fact the airport manager during a recent crash of an airplane at the Edgar County Airport (since it did occur after July 31, 2014): even though he claimed it occurred in June during Dale Barkley’s tenure. And we know that crash was not reported to either to the Edgar County Airport Advisory Board, Airport County Board Committee Members nor the Edgar County Board. If that proves to be true, then once again it makes Jerry Griffin out to be less………than…………………. truthful………………………again. Then there are statements from separate sources that he’s been flying airplanes around as pilot in command; even making some of these illegal flights from the Edgar County Airport and all against FAA regulations. That’s something we’re awaiting proof on, but in this regard we do have a county board meeting video in where Jerry himself stated, he had been flying into and out of the Edgar County Airport for the past 20 years. Apparently our County Board has forgotten what he said. So when is a pilot not a pilot or an A and P mechanic? The answer is, when using the industry (FAA) standards. 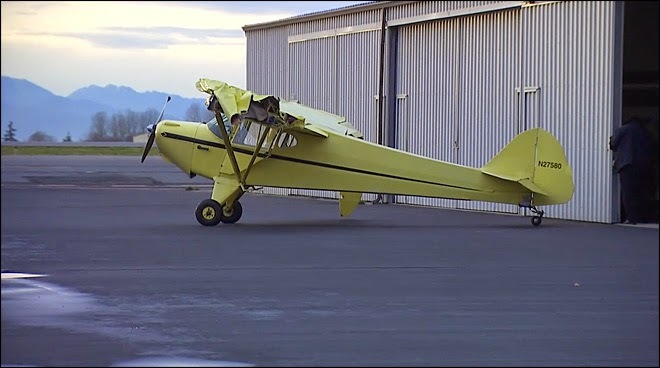 SEATTLE - A pilot made a hard landing at Paine Field Sunday afternoon, damaging his plane and two hangars, but otherwise walking away unhurt. Airport officials say the pilot lost control while landing a lightweight, vintage aircraft and careened off the runway. The plane struck two different hangars, damaging both building and the tips of both wings. The pilot was the only person aboard the aircraft, and was able to pull the plane back into the hangar. The incident happened just before 3 p.m. and delayed other plane traffic for a short time. Operations are now back to normal. Mr. Richardson praised the crew, who he said kept some nervous passengers informed about what was happening. Another passenger Anne, traveling from the United Kingdom, told Perth's Radio 6PR that the pilot's announcement was both alarming and reassuring. Engineers were due to examine the plane's air conditioning system in Perth on Monday morning, but the Qantas spokeswoman said the flight crew would have reached their maximum duty limits by that time. Passengers would be offered overnight accommodation in Perth, she said. American Airlines is conducting an internal investigation after a crew member aboard a Hawaii-bound jet reported an assault prior to takeoff Saturday from Dallas/Fort Worth International Airport. The flight was subsequently canceled, but no one was arrested. Passengers aboard American Flight 119 had already endured hours of delays due to separate mechanical issues that took one Boeing 737-300 out of service and temporarily grounded a replacement aircraft after the crewmember reported the assault. The drama unfolded after the jet finally pushed away from the gate at DFW... only to return 15 minutes later. Eric Hattey of Allen captured what happened next with his cell phone camera. DFW Police officers boarded the aircraft and removed a woman who reportedly assaulted the flight attendant. Hattey said officers spent more than 45 minutes questioning passengers about the alleged assault, but could find no witnesses. American Airlines said the flight attendant was not injured. The flight was eventually canceled because the crew had exceeded the maximum number of hours they could safely work — in part because of the police investigation. Passengers (including Hattey, who was travelling to Maui for his honeymoon) were booked on other flights to Maui on Sunday. The collapse of Wellington-based charter airline company Vincent Aviation has created financial turbulence for 178 unsecured creditors. But one creditor said he was owed less than $10 and was sorry to see the demise of Vincent's, which was established in 1989. Pricewaterhouse Cooper's first liquidators' report into Vincent Aviation, which stopped trading in October, listed Vincent's assets as "three aircraft, inventories, and accounts receivable". But it went on to say "the receivers have advised that it is unlikely that funds will be available to meet unsecured creditor claims". The report had a list of 178 unsecured creditors, and it was possible that more would come forward. The list included a host of aviation-related companies such as Air New Zealand, major airports - including Wellington, Christchurch, Auckland, Palmerston North and Nelson - and aviation authorities such as Airways NZ and the Civil Aviation Authority. Several accommodation providers were also out of pocket, including Wellington's Brentwood Hotel, Timaru's Comfort Hotel Benvenue, Auckland's Hotel Grand Chancellor, and Nelson's Beachcomber Motor Inn and Aloha Lodge. Mint Cafe, located at Lyall Bay's Retail Park just down the road from Vincent Aviation's base at Wellington Airport, and Quinny's Dry Cleaners in Upper Hutt were also owed money. Quinny's co-owner Murray Quinn said his company used to dry-clean the uniforms of Vincent's ground crew and engineers, as well as sundries such as towels. He was surprised to be on the list of creditors and said if Vincent's owed him anything it would be less than $10. "They've been very good customers and it's been a bloody shame that not one but two aviation companies [Helipro was placed in receivership shortly before Vincent's woes surfaced] were severely hit in the space of two weeks," Quinn said. Vincent Aviation owner Peter Vincent has blamed the collapse of the New Zealand arm of his company on financial issues caused by the failure earlier in the year of its Australian operations. That is borne out by a raft of creditors from across the Tasman, along with a handful from Japan, the United States, Sweden and Singapore. The liquidators' report also listed 17 creditors with secured interests. They included Westpac New Zealand, six companies with claims on aircraft, and two with claims on Toyota Hiace vehicles. There were also preferential claims, including those from Inland Revenue and New Zealand Customs, totaling $122,000.